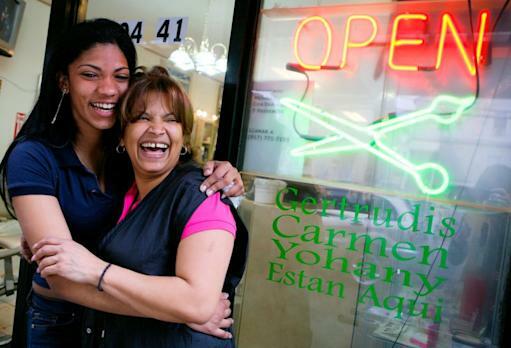 SUNNYVALE, CA and LOS ANGELES, CA--(Marketwired - March 04, 2015) - Grameen America, a nonprofit microfinance organization that helps women in poverty start and expand small businesses, and PayNearMe, the electronic cash transaction network, today announced implementation of PayNearMe as a free new loan repayment option for Grameen America's borrowers. After a successful launch in Charlotte, North Carolina, the organization will now roll out the electronic cash transaction network in branches across the country beginning with Oakland, California and Brooklyn, New York. Many of Grameen's 43,000 members use their loans to start sole-proprietor businesses such as jewelry resale and nail design, which allows them to support their families while also giving them a flexible schedule to take care of their children. The majority of these businesses operate in cash. Using PayNearMe, borrowers are able to repay their loans using cash at their local 7-Eleven store. "This innovative partnership is a remarkable advancement for our program that benefits our borrowers and staff alike," said Andrea Jung, Grameen America's president and CEO. "PayNearMe has made the payment collection process easier and more efficient. PayNearMe's cutting-edge technology allows us to expand opportunities and extend access to financial services to thousands of aspiring entrepreneurs from New York to California." By eliminating the need to count, collect and deposit cash repayments, Grameen staff gain 40 minutes each day that they can spend with borrowers, providing financial education and facilitating problem-solving for the borrowers' businesses. Using PayNearMe streamlines Grameen's accounting processes while enhancing financial controls and efficiencies, which will allow the organization to build capacity to reach 150,000 women by 2018. "We no longer stress about the amount of cash we are carrying to the bank, and the borrowers feel safer not having to congregate in one place every week with large chunks of cash," said Ursula Lalone, Grameen's Charlotte, North Carolina center manager. "With PayNearMe, we don't have to count and collect cash. It's a huge advantage to focus our meetings on helping the women invest, save and grow their businesses." Most of the 7,800 participating 7-Eleven stores nationwide are open 24 hours a day, seven days a week, making it easy and convenient for borrowers with even the most complex schedules to stay on top of their loan repayments. To make a payment, a borrower simply walks into the 7-Eleven, hands the cashier their PayNearMe payment code and the cash payment. Additionally, if they choose to pick up some groceries while they are in the store, they can pay for everything in one easy transaction. "Grameen America is living proof that the term 'micro' is relative," said Danny Shader, PayNearMe's founder and CEO. "A microloan to one person can make a macro impact on another. We're proud to support Grameen's work by offering this payment option at no cost to the borrowers. Everyone should have a right to pay the way they are paid, without having to jump through hoops." PayNearMe is the electronic cash transaction network that enables consumers to pay rent and utility bills, repay loans, buy tickets, make online purchases and do much more with cash. Consumers can conveniently make payments on their own schedule and in their own neighborhood in less than a minute at one of over 17,000 trusted locations, including 7-Eleven® and Family Dollar® stores across the United States. For more information, please visit: http://www.PayNearMe.com. Founded by Nobel Peace Prize recipient Muhammad Yunus, Grameen America is a 501(c)3 nonprofit microfinance organization dedicated to helping women who live in poverty build small businesses to create better lives for their families. Grameen America offers microloans, training and support to transform communities and fight poverty in the United States. Since opening in January 2008, Grameen America has invested over $230 million in more than 43,000 women. Started in Jackson Heights, Queens, Grameen America has expanded across New York City and in Indianapolis, IN, Omaha, NE, Oakland, CA, Charlotte, NC, Los Angeles, CA, San Jose, CA, Austin, TX, Union City, NJ, San Juan, PR and Boston, MA. Learn more at www.grameenamerica.org.